In search of a good plant-based alternative to pork? Tempeh is an excellent choice! Tempeh’s meaty texture and subtle but complex flavor, full of delicious umami, offers a way to replicate the experience of eating pork vegan-style. Tempeh is a centuries old superfood made from beans that are minimally processed and fermented. It can be used to replace meat in many recipes, plus it has the added benefit of being one of the Worlds Healthiest Foods! These days, most forward-looking restaurants offer at least one vegan option on their menu. One vegetarian can cause a whole group of diners to either frequent or skip a particular restaurant. And even though a fairly small percentage of the population is strictly vegetarian or vegan, a much larger number of people are “meat-reducers” or “flexitarians”. These are people who are cutting back on their meat consumption, or who are eating vegan meals sometimes. About a third of millennials eat a meat alternative every day. 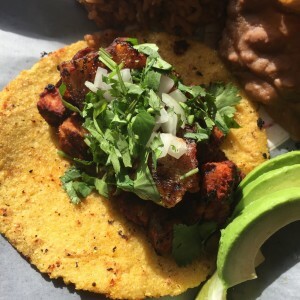 When Freebirds World Burrito wanted to add a vegan dish to their menu, they took a traditional Mexican recipe, usually made with pork, called calabacitas, and substituted tempeh for the pork. 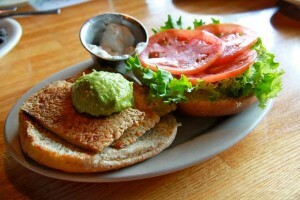 We at Texas Tempeh are honored to be the suppliers of the tempeh in their Austin locations! People who like the taste of pork, especially cured pork like bacon, do so partly because of bacon’s high amount of umami or free glutamate. The delicious, savory taste of high protein food comes about when large protein molecules, made up of many amino acids, are broken down. Umami signals that the food being eaten contains protein in a form that’s ready to be utilized by our bodies. Tempeh makes a great plant-based pork stand-in because it, too, is high in umami. In fact, tempeh has more umami than bacon! Why does tempeh have so much umami? It’s because the beans are fermented. The mycelium, or “roots” of the Rhizopus oligosporus mold that we grow on the beans breaks down the protein molecules. This incredible, edible, delicious mycelium is also what holds the beans in together, forming dense, chewy slabs. Tempeh is traditionally made with soy beans. At Texas Tempeh, we also make garbanzo tempeh and black eyed pea tempeh. All organic, of course! Two Austin area food trucks use Texas Tempeh’s Garbanzo tempeh as a substitute for pork in their tacos. Cool Beans has The Native Taco. 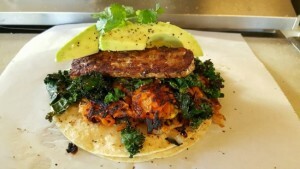 In this al pastor styletaco, tempeh deliciously subs for the meat. 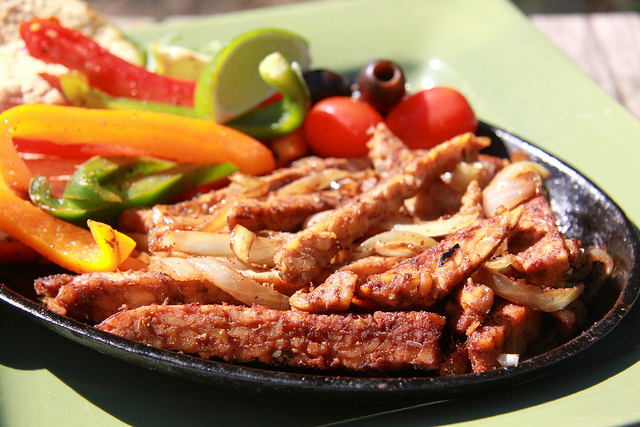 Vegan Nom has created a marvelous tempeh marinade an d will add garbanzo tempeh bacon to any taco! Counter Culture serves tempeh bacon during weekend brunch. 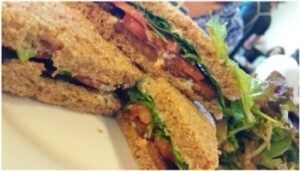 Mother’s Cafe and Garden offers an amazing “TLT” sandwich. A few years ago, we sold some tempeh to a chef at one of Austin’s hotels. He had been preparing food for hotel guests for over 30 years. “Used to be”, he said, “people would eat what you put in front of them. Now, one guest might be lactose-intolerant, another guest wants gluten-free, another guest is vegetarian”. People are becoming increasingly health conscious and It is quite a job to have choices for everyone! Tempeh can be the perfect solution! And Texas Tempeh is naturally gluten-free. Since we now have scientific proof that processed meats like bacon cause cancer, a much better choice for health are plant-based “meats” like tempeh. With its cancer fighting isoflavones, loads of minerals like magnesium, lots of fiber, no cholesterol, a rich delicious taste and meaty texture, tempeh can be called the healthy white meat! This recipe is quick and easy. This makes a perfect BLT or adds just the right touch to a veggie burger. Mix remaining ingredients. 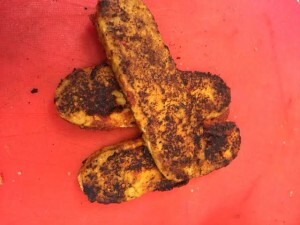 Coat tempeh slices with marinade. Let tempeh sit for 3 to 5 minutes. Fry tempeh until crisp, roughly 2 minutes per side. If a smokier bacon is preferred, add a splash of liquid smoke to the marinade. Beth received a degree in Electrical Engineering from the University of Maryland. She worked for the environmental protection agency for a few years, before leaving to pursue her calling in Animal Rights. Living in a suburb of Washington, D.C. allowed Becky and Beth to meet many animal rights activists. We met River Phoenix and his fabulous family at an animal rights conference. Beth had a chance to meet Peter Singer, author of Animal Liberation, and worked for a time for FARM (Farm Animal Rights Movement). In the late 90's we moved to Austin, Texas and it wasn't long before Tempeh took over our lives.